Petit Jean State Park was Arkansas’ first state park. Several trails can be combined for hikes of varying lengths up to about 16 miles. 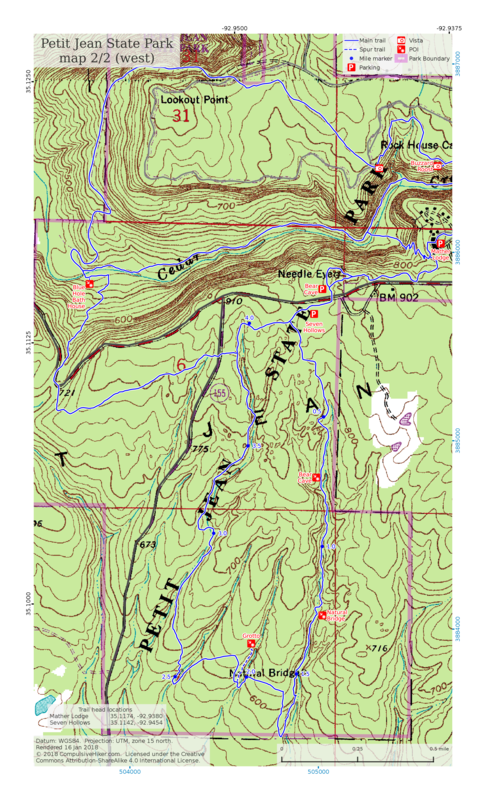 Highlights include Cedar Creek Canyon and Cedar Falls. A simple but slightly inaccurate map. Aug ’14, Sep ’14, and Nov ’14 trips. The only way to get to the bottom of the falls is to go down the Cedar Falls trail from the lodge, or to go east on the Canyon Trail from the Blue Hole area. You can’t get there from the north (on a trail). These maps are sized for 8.5×14″ (legal) size paper. Note they are at different scales. Click on an image to get it full-size for download. Every time I update the maps the images will have different names so if you want to bookmark or share them, link to this page – not the images. 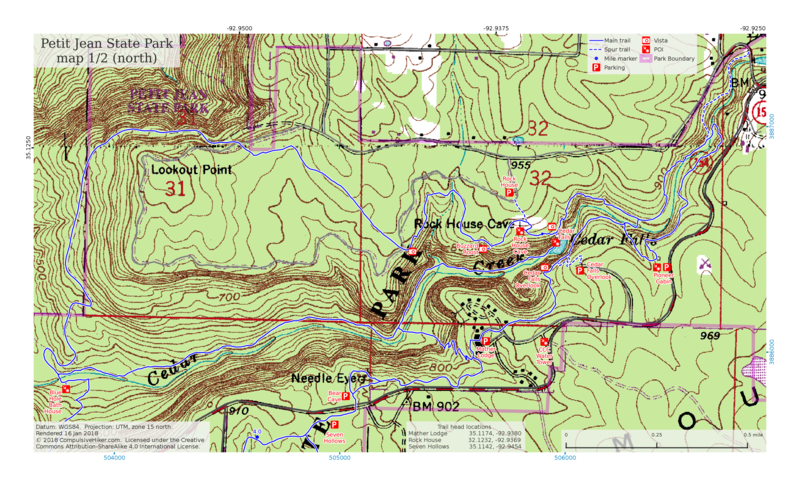 Jan 2018 update: The overall style of the map had been updated, a legend has been added, and an information box now shows coordinates for some major trail heads . Aug 15 2016 update: The state park boundary is now shown in light purple. The symbol styles have been changed to be consistent with my other maps.